Speedball 2: Brutal Deluxe was released for several platforms, including the Atari ST, Amiga, Amiga CD32, DOS, Commodore 64, NES, Sega Mega Drive, Sega Master System, Game Boy and Game Boy Advance. The first version was released in 1990 for the Atari ST, the final version twelve years later for the GBA. According to the game story, the first Speedball league (founded in the year 2095) fails due to violence and corruption. 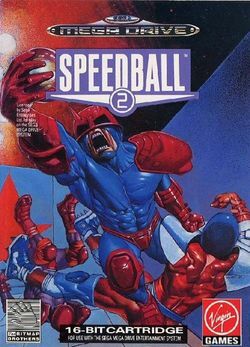 As the organisation gives place to anarchy the game is forced underground, but five years later, in an attempt to regain public interest, Speedball 2 is born. The game starts in 2105 with the emergence of a new team, Brutal Deluxe. Speedball 2 makes several changes over the original Speedball. Teams have nine players on court rather than five, and targets on the floor and walls can be hit to receive bonus points. The amount of points that a team receives for scoring a goal starts at 10 but can be increased to 15 or 20 via the use of score multipliers located on the walls of the pitch. The same amount of points for scoring a goal is given for injuring a player from the opposing team. When a player is injured, he is replaced by one of three substitutes. If all three substitutes are injured, the injured player will be forced to return to the game and play on in spite of his injuries. There are five game modes: knockout, cup, league, practise and multiplayer. Each game lasts for 180 seconds. This page was last edited on 29 June 2012, at 11:11.